It rained really hard at times on Saturday, and then on Sunday, things warmed up and it was sunny again. We headed out to the woods to take in the autumn sights and walked this path along Gorton Creek, passing by this footbridge. The smell of the damp forest air was amazing. The sun warmed everything and cast a beautiful golden light on the changing leaves. Beautiful golden light describes it so well. Pretty shot, I love the colors and the scene! Have a happy day! What a beautiful photo! What else could I say? It's beautiful! Beautiful light, and I really like that bridge. 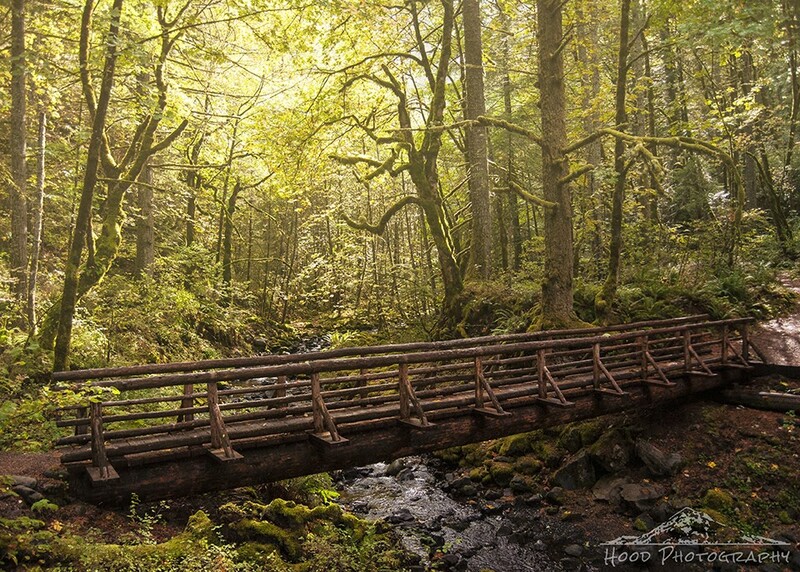 The woods are beautiful, but the little footbridge is my favorite of the picture. Like the way the light is magically popping out of the trees. A lovely shot ... footbridges are always so inviting. Beautiful autumn photo, I especially like the footbridge. This is gorgeous... it reminds me of Germany. Really a beautiful image, Sarah.